Myanmar is tenth among the world’s fish-producing countries and third in ASEAN (Association of Southeast Asian Nations). To understand the mechanisms underlying the high production, oceanographic and phytoplankton surveys, including primary productivity measurements based on pulse amplitude modulation fluorometry, were conducted near an active fishing ground near Myeik City. 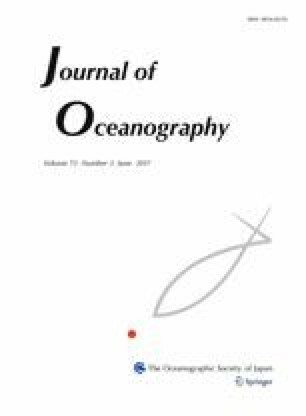 Three surveys, one in each of the representative seasons and covering the characteristic coastal environments, showed well-defined seasonality in primary production and phytoplankton occurrence. End of the dry season was the most productive, with productivity of 2.59 ± 1.56 g C m−2 day−1 and high concentration of chlorophyll a (3.14 ± 2.64 µg L−1). In this season, the phytoplankton population was dominated by high densities of the diatoms Bellerochea horologicalis and Chaetoceros curvisetus, whereas primary productivity was low at the onset of the dry season, 1.36 ± 0.77 g C m−2 day−1. However, this low primary production might be compensated by activation of microbial food chains originating from high dissolved organic carbon. The rainy season exhibited the lowest production, 6.6% of the end of the dry season, due to the extensive discharge of turbid water from the rivers which lowered euphotic layer depth and resulted in an unusually high diffuse attenuation coefficient of 2.30 ± 1.03 m−1. This incident of turbid water may be related to soil erosion from deforestation and mangrove deterioration. This research reveals the seasonal trend in Myanmar’s coastal productivity and its relationship to the tropical monsoon climate as well as emphasizing the importance of tropical coastal environments to the sustainability of the fisheries. The online version of this article (doi: 10.1007/s10872-016-0408-7) contains supplementary material, which is available to authorized users. This work was supported by JSPS KAKENHI Grant Number JP 26304031 to KK as well as a Grant-in-Aid for Project Research (2011) from the Graduate School of Biosphere Science, Hiroshima University. We would like to thank the officers from the Department of Fisheries (Myeik) and staffs from Myeik University, Myanmar, for their collaboration and assistance with our field sampling surveys. We also give grateful to the Myanmar Fisheries Federation (MFF) for the kindly support during our visit to Myanmar.